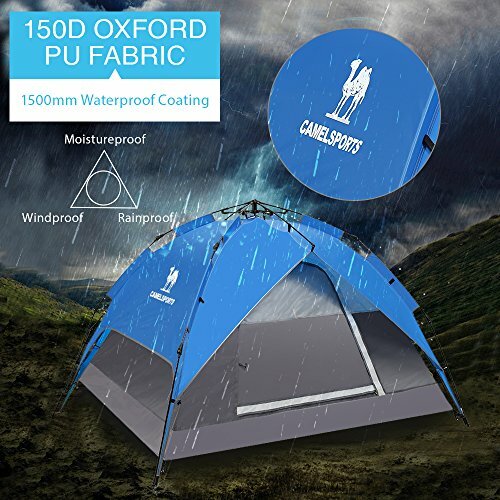 【RAINPROOF & UV PROTECTION】 150D Oxford PU 1500mm waterproof coating with seamless bonding process features excellent 1500 waterproof ratings and UV protection for the whole tent. 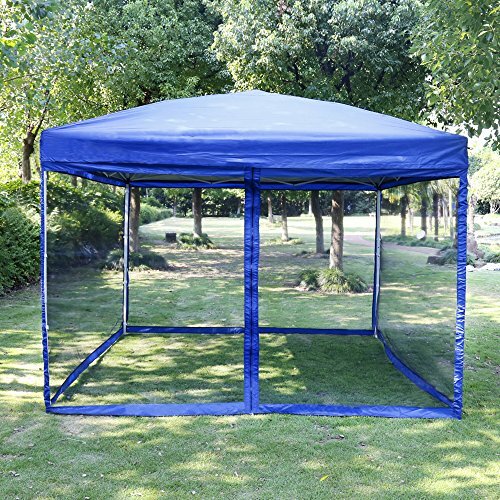 GFRP(Glass Fiber Reinforced Plastic) frame bars are strong enough to keep the tent stay in place even in heavy rain or strong winds. 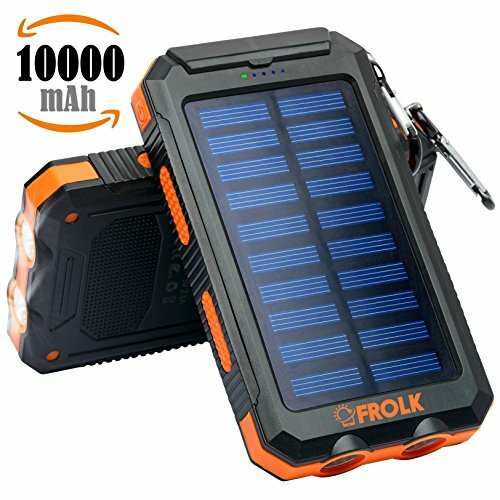 Perfect for camping, hiking, backpacking, beach, fishing, travelling or any outdoor activities. 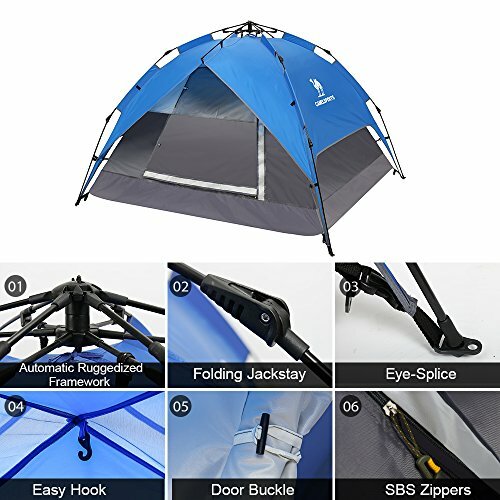 【EASILY SET UP & TAKE DOWN】 Automatic umbrella structure with rope design enable 1 person to set up and take down in seconds. You can open it just by lifting up the top frame bars with rope after laying flat tent and pack it by pressing down center frame bars with hands and folding it(8 stakes and 4 ropes in the package). 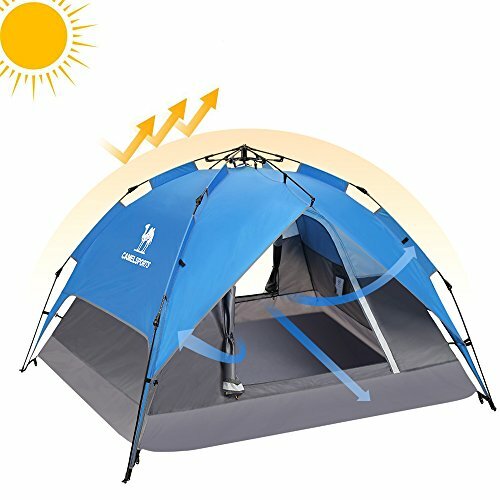 This camping tent is treated with 150D Oxford PU 1500mm waterproof coating, which is rainproof, windproof but keep ventilate well. Strong frame bars and tough wind ropes intensify its safety. Inside hook is easy to hang camping lantern or other small things. 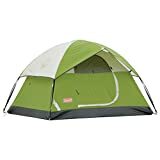 It is very suitable for 4 seasons and you can camp in all weathers, not only in sunshine spring and sweltering summer but also cool autumn and snowy winter. 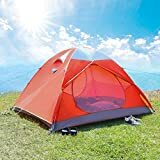 It will be an unforgettable experience to camp with family or friend with this lightweight and multifunctional tent in weekends or holiday. 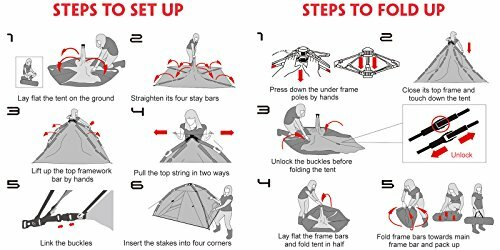 1) Lay flat the tent on the ground. 2) Straighten its four stay bars. 3) Lift up the top framework bar by hands. 4) Pull the top string in two ways. 6) Insert the stakes into four corners. 1) Press down the under frame poles by hands. 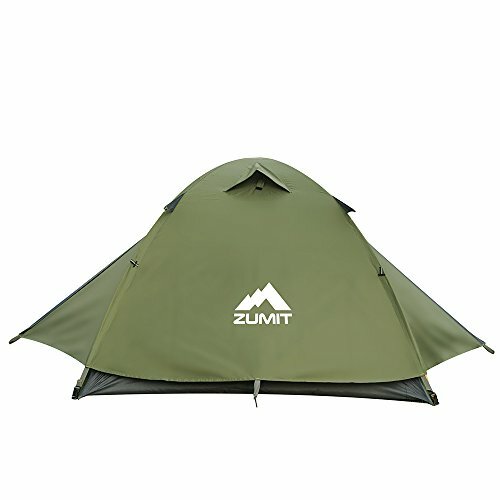 2) Close its top frame and touch down the tent. 3) Unlock the buckles before folding the tent. 4) Lay flat the frame bars and fold tent in half. 5) Fold frame bars towards main frame bar and pack up. 【MULTIFUTION】 Roomy space for 2-3 adults or 3-4 kids/teens. 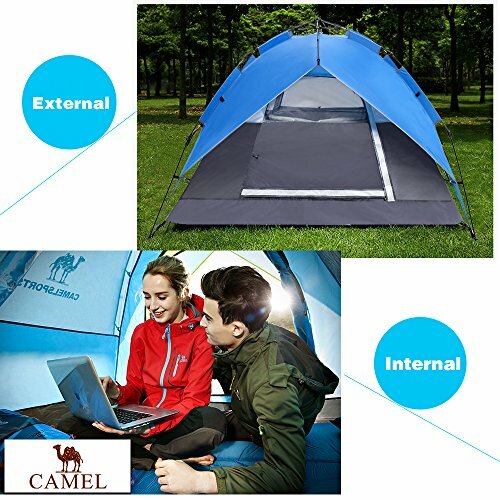 Camel family tents has two layers in three usages. 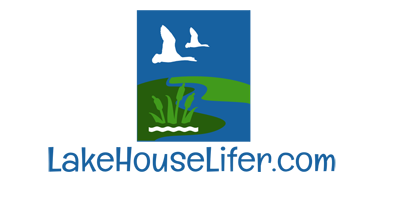 Inner and outer layer can be used separately according to different occasions. 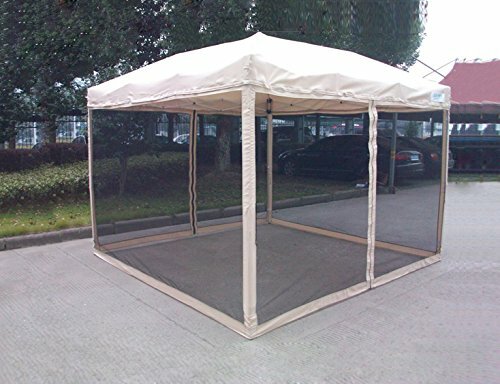 Outer layer can be used as rain fly, sunshade or fishing awning. 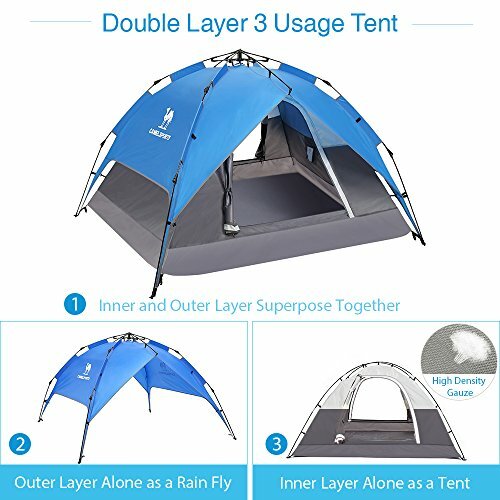 Inner layer can be used as an intact tent but needs to be equipped with extra stay bars. 【HUMANIZATION DESIGN】 Four sides cross ventilation can maximize cool and avoid mosquitos in summer. Rolled up door curtain with buckle is easy to enter and exit. Good corrosion resistance and rust prevention stakes and four sturdy wind ropes provides safer guarantee when use. 【DIMENSIONS】 Outer Layer: 86.5(L) x 78.7(W) x 47.2(H) Inches; Inner Layer: 72.8(L) x 65(W) x 45.3(H) Inches; Package Size: 27.5(L) x 5.9(W) x 5.9(H) Inches; Weight: 7.5lb. 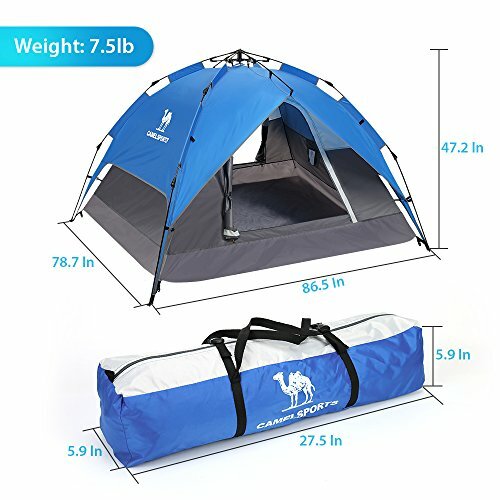 Coming with a storage bag, makes this portable camping tents more easily to be carried.